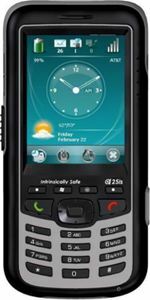 AT&T has announced a new rugged phone which is known as Airo Wireless A25is. The phone is claimed to be the first intrinsically safe-certified smartphone in the world. The 2.8-inch Airo Wireless A25is has been created to meet the specifications of IP 67 and MIL STD 810-F. The phone can be immersed in up to 1.5 meters of water for half an hours and operate in temperatures with the range of -20 ° C to 50 ° C. Beside that, it can operate in potentially explosive environments such as process and chemical manufacturing, the petrochemical industry, the military and etc. Cellular GSM / GPRS / EDGE 850/900/1800/1900 MHz. Operating system Windows Mobile 6.0/6.1 Professional. Processor XScale PXA270 (416 MHz). Memory 128 MB RAM, 128 MB ROM. MiniSD slot (cards up to 2 GB). 2.8-inch touchscreen display with a resolution of 240×320 pixels and 16M colors. Communication – Bluetooth 2.0, USB 2.0, Wi-Fi (optional). “The addition of Airo Wireless A25is to AT&T’s portfolio of non-stocked ruggedized mobile devices will help enhance efficiency, connectivity and safety among personnel at sensitive establishments and other industrial work places that operate in extreme or demanding conditions. AT&T is proud to be the world’s first carrier to certify this device for use on its wireless network as it demonstrates our commitment to the rugged enterprise market by consistently offering cutting edge solutions for our business customers,” said by Chris Hill, vice president, mobility product management, AT&T Business Solutions. The Airo Wireless A25is with dimension of 142.4x68x24.4mm and weighs 275g is available via AT&T.